Paddle sports, particularly kayak fishing, are the fastest growing water sport today. Kayaking, canoeing and rafting are now destination activities. With all the green and eco friendly activities available, paddle sports have dominated the outdoor adventure scene. Paddle sports are low impact on the environment, inexpensive, thrilling and always memorable. Not to be left out, the fishing and sporting communities wanted in on this explosion. Kayakers, anglers and sportsmen merged concepts and technologies. Along with diversity came opportunity. New specialty equipment, gear and accessories evolved. Fishing kayaks and kayak fishing hand paddles evolved from this call to action. Don’t forget to properly store your kayak when you are done, click here to see the best way to store a kayak in a garage. For ease of access and dismount, the anglers use a modified version of the sit on top kayak, or SOT. SOT’s were a natural conversion platform for kayak anglers. These boats are self bailing, meaning that any water that gets in the kayak will be drained away by gravity. Getting on and off is much easier than a sit in kayak. Turning or sliding around to access tackle or gear behind you is a much simpler evolution. It soon became apparent that flailing a seven foot paddle is not conducive to shallow water, or skinny water fishing. The fish can see you! The best way to sneak up on your prey is to glide stealthily toward them. While holding your fishing rod, using a little six or seven ounce fishing hand paddle to propel your kayak, about 16” long, is perfect for the task. As you begin your foray into kayak fishing, do your research. Peruse the internet, talk to local anglers, visit local outfitters and try various kayak platforms and fishing hand paddles. That little effort will certainly make your fishing trip much more rewarding and memorable. This entry was posted in Uncategorized and tagged kayak fishing, kayak fishing hand paddles, kayak paddles, kayaks, paddle sports on February 26, 2010 by Paddleman. 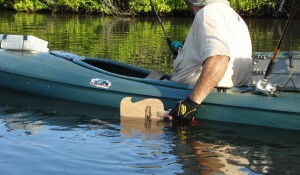 Backwater Paddle Company introduced the concept of the kayak fishing hand paddle. The introduction of the Predator and Piranaha Kayak Fishing Hand Paddles has solved many kayak angling problems. These paddles are a simple solution to a confusing problem encountered while kayak fishing. Backwater Paddle Company finally decided it was time to bring the kayak fishing hand paddle concept main stream. Today, these lightweight and ubiquitous paddles are transforming the kayak fishing sport. Kayak anglers have declared it is time to adapt and overcome those traditional barriers! Simply place one of these six ounce or seven ounce Predaotr or Piranha Kayak Fishing Hand Paddles between your legs, or close by. Stow away that unwieldy seven foot kayak paddle. Grab your fishing rod. Now you can stealthily paddle and fish without spooking your prey. 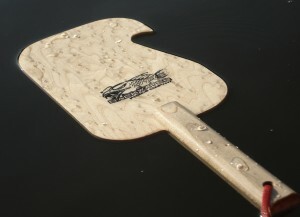 Backwater Paddles introduced a couple of fishing hand paddle models available to the kayak angler and sportsmen market. After the first kayak fishing hand paddle prototypes were tested, it became apparent that having more functions would add to the benefit. Obviously this is quite niche and the regular fishing boats are still much more popular with places like Intrepid Powerboats that has a full selection of powerboats. It is nice however to see these new ways of doing old things. The “hook and teeth” blade designs of Backwater Paddles became readily accessible and dominate the kayak fishing hand paddle market. Having a fishing hand paddle is awesome; having that ability to grab onto or push off any object with the hook and teeth is a real bonus. This entry was posted in Backwater Paddle Products and tagged kayak fishing, kayak fishing hand paddles, kayak paddles, kayaks on February 23, 2010 by Paddleman. Is their perpetual motion in marketing? Backwater Paddle Company has struggled to get where we are now. It has been a long slog through a nasty recession. Backwater Paddles almost faltered at the start due to the bad economic times. On top of that, breaking into a new, yet growing market, where your product has never existed presented its own unique challenges. After a year or so of just keeping the business together, all the little things I have done have seem to come together. Maybe it was just throwing enough fodder out there that something would catch and hold on. Maybe it was changing the business plan in mid stream and coming out with the kayak fishing hand paddles. Maybe it was just the market starting to rebound. Maybe it was because I did find the right product at the right time for the right market? Nevertheless, Backwater Paddles has been fortunate enough to begin feeling like we are somebody. The past two months have been a renaissance in company and product awareness. We are being noticed. Somebody likes our product and sees a useful benefit. We are generating sales, albeit very nominal, but someone does want to try our Predator and Piranha kayak fishing hand paddles. Starting a project in a niche market is hard enough. Try designing and selling a product to a market that has never existed before! I am not saying kayaks nor fishing have never been around, but kayaks and fishing togetherhave spring boarded into the paddle sports market…bringing us kayak fishing. Ever being an optimist, where there is growth, there is opportunity! Getting noticed in your market is an overwhelming task. Third, a SEO agency backs my statement up, “Getting noticed in your market without dumping boat loads of green backs into your marketing campaign is an overwhelming task! “. As a start-up company owner, working from savings, and a part time job is all you have to work with monetarily. Without big corporate sponsors, investors and funding companies at your disposal, getting your marketing campaign off the ground requires tons of patience and good luck. Once Backwater Paddle Companies investors bailed at the start of the recession, I knew all bets were off and this would be a struggle. I had to knuckle down and explore EVERY opportunity, EVERY contact, EVERY lead, and EVERY scheme. I had to be proactive. I know deep down, there would be no one else sitting down at this computer, for hours on end, doing this for me. With the evolution of kayak fishing came new equipment, new gear and accessories. Being in the right spot at the right time was all we needed for a competitive edge. The evolution of kayak fishing hand paddles became the focus of our market campaign and Backwater Paddles rise into the paddle sports community. But again, it all boils down to the green backs. Fortunately, perseverance has paid off to some degree. Backwater Paddles is breaking into the paddle sport news without having sunk beacoup green backs into marketing. Is this good luck? Will the exposure keep growing on its own with little or no more input from me? Has all the last year of relentless Internet research finally paid off? Sure, I’d like to believe that. Sure I’d like to believe in perpetual motion too. But I know at some point I am going to have to get some green backs from someone to keep this marketing machine moving forward. By the way…do you know anyone wanting to get in the ground floor of a paddle sports company? I am going to need some green backs soon!! This entry was posted in Marketing My Company and tagged kayak fishing, kayak paddles, kayaks on February 17, 2010 by Paddleman. Blessing do come in disguises. You just never know what or how they are disguised, until you have time to reflect. As owner of a start-up paddle sports manufacturing company and part time tourist eco-guide, trying to keep your business running is a full time job. However, only one of those jobs pays the bills, barely…the part time tour guide! I am quite fortunate to have some very close friends who have accommodated my paltry lifestyle. I have sacrificed everything I have to get this company to this point. The recession stalled our project, but that is another story. It was what happened during the recession that is now paying off in our survival marketing campaign. Even though the recession forced us to temporarily shelve the Raptor Kayak Paddle project, we also re-identified ourselves and evolved along the way. We have now refocused on our Predator and Piranha Kayak Fishing Hand Paddles. A simple solution to a complex problem of trying to paddle your kayak and fish at the same time! But that is still not the story. It was what happened in between the recession and our new direction. Networking! After the recession, I spent a huge amount of time online talking to everyone. I talked to manufacturers, paddle companies, outfitters, store owners, guides, web designers, yak fishermen and to any one who would listen to my story! I had to cement Backwater Paddles name into peoples minds. Failure was not an option for Backwater Paddles! I knew that the economy would come back one day. When it was time for Backwater Paddles to get back into business, I wanted us to be there with our name in peoples minds. I was basically establishing an awareness campaign with no marketing budget, while the recession was on. When do you know the recession is over and it is time to get back to marketing again? For us it was when anglers and sportsmen started to ask questions about our hand paddles. These contacts were direct results from my networking campaign, even better yet, some were the indirect results. They had heard about us from someone else. When you have no marketing budget money, when the economy is tough, when you question your company…get ut and talk to someone. With the internet at your finger tips, people are just a few key strokes away. Find out who the movers and shakers are in your line of business and start emailing them about your company. Do not make the first contact a sales pitch. Probably not even the second time either. Feed them slowly with information about your business and products.. Give them something to hope for. When the time is right, through all the phone calls, emials and networking you have done, they will start to come looking for you and being more receptive of your product. It all starts with communicationg to everyone about your company. Basically it boils down to if you are not the one talking to everyone about your company, no one else will be either! This entry was posted in Marketing My Company on February 3, 2010 by Paddleman.